Shortly after joining Twitter, I was part of a group DM with a few other girls I had started speaking to via Twitter. I mentioned the idea of having the ‘MH Crisis Angels’ team so that we could support people wanting to reach out via Twitter DM. I had made friends with Khadra quite easily as we had an immediate understanding of each other and clearly had a lot of similarities. As soon as I pitched my idea to her, she immediately understood my aims and was on board. About a week later I finally took the time to put a new Twitter account together @MHCrisisAngels. We put out tweets to tell people what our aims were, and asked for anyone who would like support or to volunteer to help with us, to DM the ‘Angels’ account. The following couple of weeks were a bit of a whirlwind to be honest and I truly cannot even really remember how it all happened. We immediately had people on board, we had a structure, we had people reaching out. The response was positively overwhelming. With my vision, and Khadra’s Counselling background, the team quickly became strong – word was getting out to the Twitter Mental Health Community, and the Service Users were clearly getting a lot of support. The aim of the group wasn’t to provide a professional Counselling service, or suicide prevention. It was to provide the listening ear of someone who truly understood MH battles. Sometimes having someone to talk to is all it takes, and this is exactly the feedback we were getting from our Service Users. All chats were supervised to ensure both Angels and Service Users were safe at all times, and Khadra was amazing at guiding the new Angels through their chats! She coached them and gave advice, as well as supporting me in making decisions about what direction to take things, and who to bring on board etc. We wanted to make sure we had the right people with us! There were roles for everyone, no matter how involved people wanted to be… we had Crisis Angel roles for those wanting to run support chats, and we had Angel Advocate roles for those who wanted to help spread the message about what we do. The team gelled really quickly and soon became close friends. The timing coincided with a new job for Khadra. After much deliberation, she made the tough decision to give herself and her life the focus she deserved, as she was no longer able to commit the time that the MH Crisis Angels demanded. I really don’t think any of us expected how much demand it would place on us, so while we were all so disappointed to lose her, we understood the reasons for her decision. After Khadra left, we had to continue to push forward, and that is what we did. The role that Khadra had filled as Co-Founder could not be replaced, but I created a new role of Engagement Support Angel, so that I had someone supporting me in new recruitments, and initial reach out contact. The role was filled by someone I had connected with prior to setting up MH Crisis Angels, Dave. Kate agreed to supporting with resourcing materials such as links for suicide prevention lines and sites for countries around the world, as well as support materials which may be required during chats. She took the role on as ‘Research Angel’. We began receiving high praise for the support service we were providing. The ‘Angels’ were gaining more confidence with each chat they lead. Only a couple of months since launch, we are doing fairly well. People regularly reach out and we have received such high praise for the support we have offered, as well as having a closely bonded and well structured team. All we want is for people to know we are here, that we care, that we will listen to whatever they need to talk about. 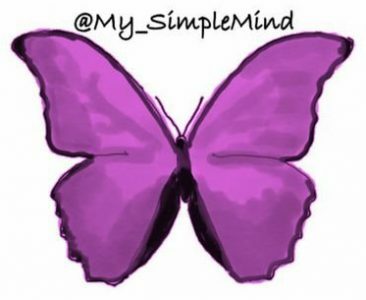 Having the ‘My Simple Mind’ account and the ‘MH Crisis Angels’ account gives me a purpose, makes me feel useful. I feel like I have found my place in Social Media. I feel like this is me. You are an inspiration to us all, generose and with such a huge amount of empathy. What you’ve done is amazing and not only have you helped your service users but you have given unstinting unstoppable support to your team.